Most motorcyclists understand that aftermarket exhausts do not always provide a performance boost. In fact, they often create issues that have to be addressed on the intake side, like jetting or computer mapping. Vance and Hines does make a subtle claim of "power" for the Honda Shadow Sabre, but that is not the main focus for most of the cruiser market. 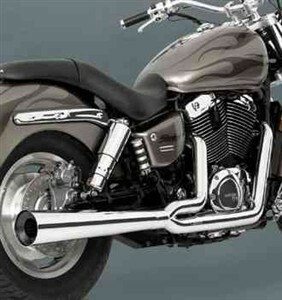 The look and sound of the exhaust is the feature that Vance and Hines is marketing in this system. The system is supposed to be designed to prevent heat discoloration, so that chrome gleam can live on for miles. They also boast a "removable baffle," which is a not-so-subtle invitation to make the system louder than stock. After all, motorcycling is a visceral experience, and the unique sound a motorcycle makes is a big part of that experience. The system is not cheap, but no full exhaust system is. This may be a nice addition to your Honda Shadow Sabre.